The Hafler CI-1255e™ is an innovative 12 channel amplifier designed for multi-zone custom homes as well as numerous demanding commercial sound installations such as restaurants and social houses where high performance audio is required and reliability is of utmost concern. The design begins with gold plated RCA inputs or optional Euroblock (Phoenix® style) connectors for each channel. 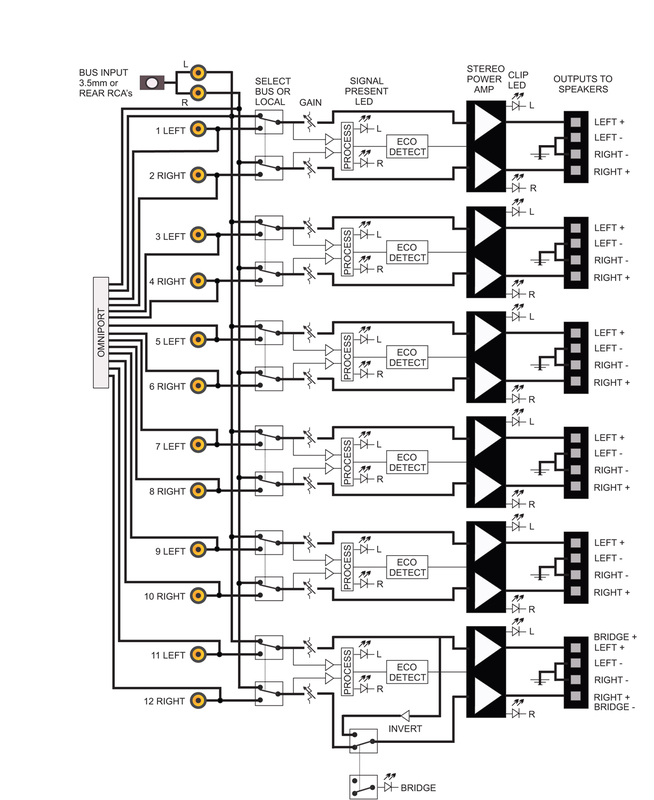 A stereo bus input may be used to feed any or all channels simultaneously from a single source. This is paralleled on the front panel via a convenient 3.5mm input for an iPhone®, tablet, or Bluetooth® interface. Speaker outputs also employ detachable Euroblock (Phoenix style) connectors for easy termination. 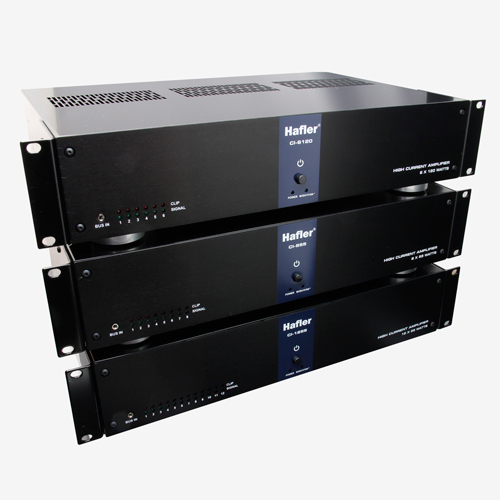 As with all Hafler amplifiers, sound quality and reliability are paramount. 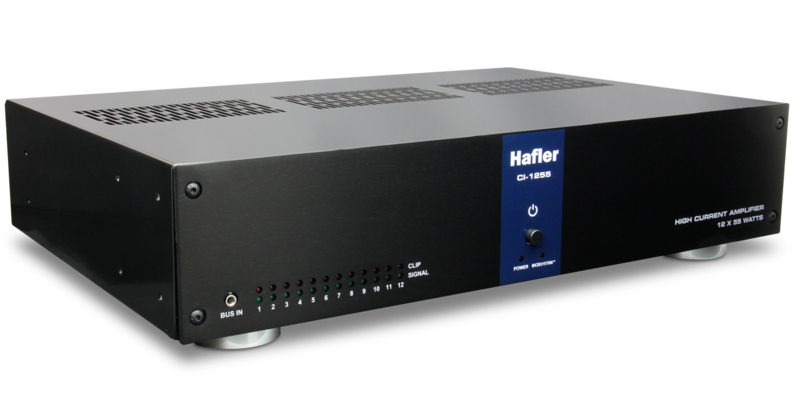 Unlike other multichannel amplifiers that use sonically compromising class-D or H switch-mode designs, the Hafler CI-1255e employs true class AB architecture to deliver 55 watts RMS per channel (100W peak) of pure power at 8 ohms and 70 watts RMS (140W peak) at 4 ohms on each channel. 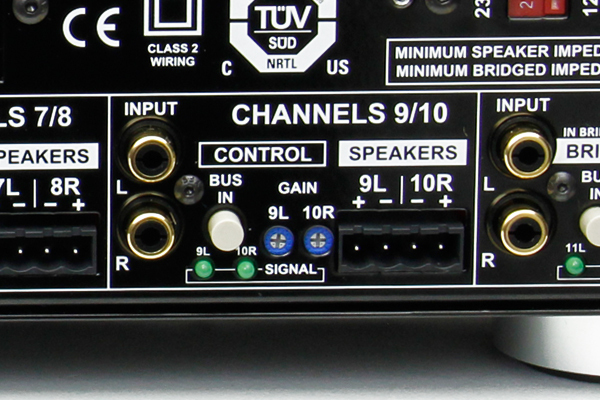 Channels 11 and 12 may be configured in bridged mono mode to deliver 180 watts RMS to power a subwoofer. Individual gain controls on each channel allow for precise adjustments for each of the 12 zones. Front and rear panel signal presence LEDs provide further aid during setup by allowing for visual monitoring of signal flow. Should a fault be encountered, the CI-1255e will automatically shut down the compromised channel and self-reset when the fault is removed. This is augmented with peak LEDs on the front panel to monitor signal levels for each zone. An OmniPort™ allows for additional connectivity choices with optional modules for a Dante® digital network card, Jensen transformer-isolated inputs, or Euroblock inputs. Housed in a compact 17" x 3.5" x 11.5" (432 x 89 x 292mm) solid steel enclosure, the CI-1255e may be rack-mounted in a standard 19” 2 RU rack using optional rack ears. An ultra-quiet side-mounted HushTone™ fan generates a mere 22dB as it circulates air to cool the unit. The CI-1255e is equipped with an ECOSYSTEM energy conservation circuit, which will automatically shut off the amplifier after one minute when not in use and will power-up in just 10 milliseconds once an audio signal is detected at any of the inputs. To address international usage, the CI-1255e is equipped with a dual-voltage toroidal power transformer with a selector switch for 115V and 230V operation, and is safety certified for use throughout North America and Europe. 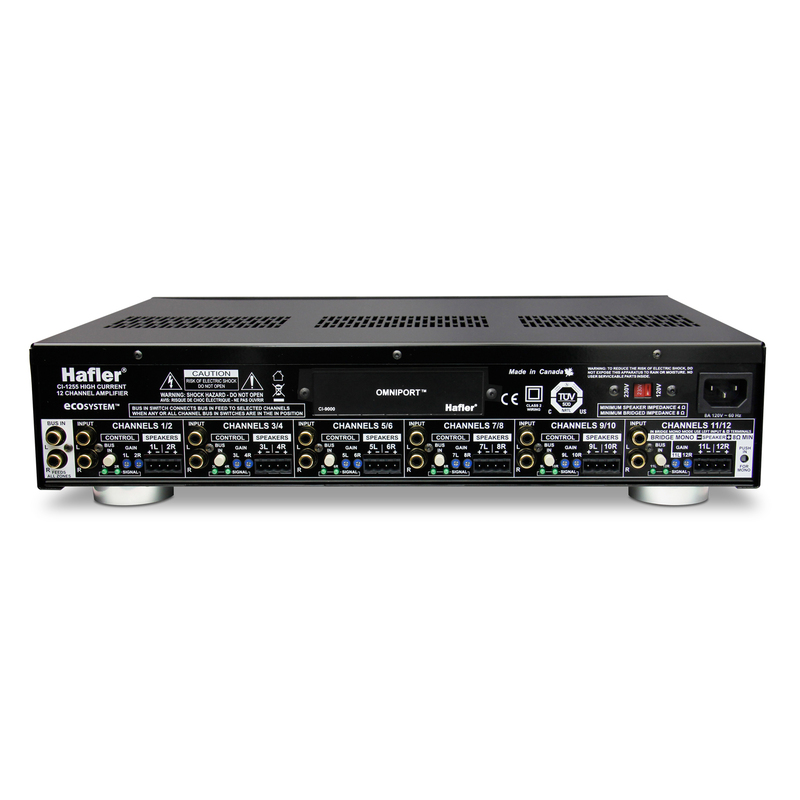 The Hafler CI-1255e delivers legendary reliability and unparalleled sound quality for the most demanding multi-zone installations. 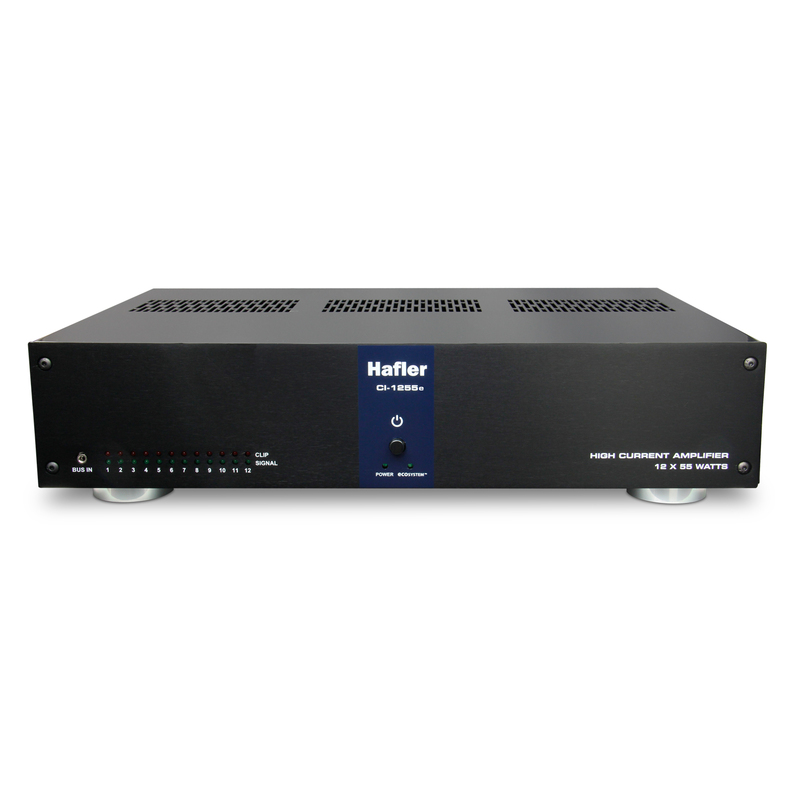 Each Hafler multichannel amplifier features an innovative Omniport™ expansion slot, which allows separate modules to be installed that add useful features and increase the functionality of the amplifier. 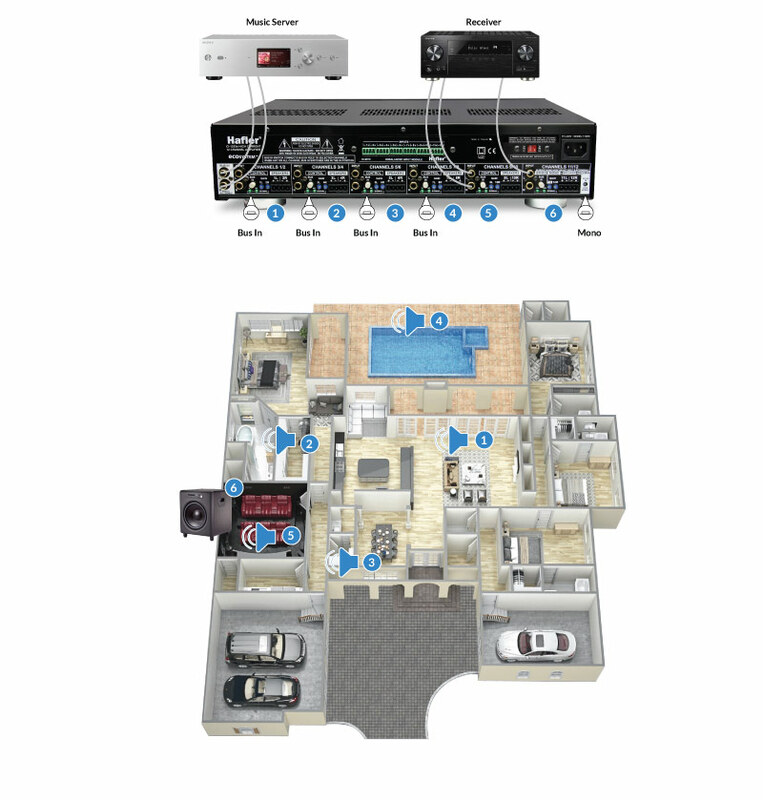 Available Omniport modules include USB, HDMI, and balanced Euroblock inputs—even the ability to connect to a Dante-enabled digital network. 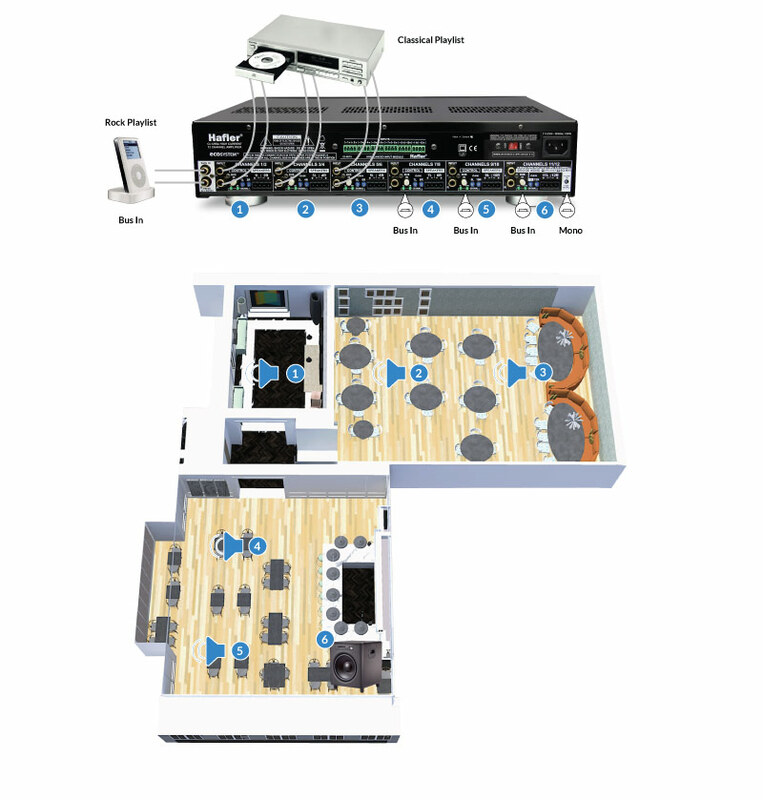 With Omniport, you can tailor your CI-series amp to suit your current connectivity needs or adapt to future requirements with ease. 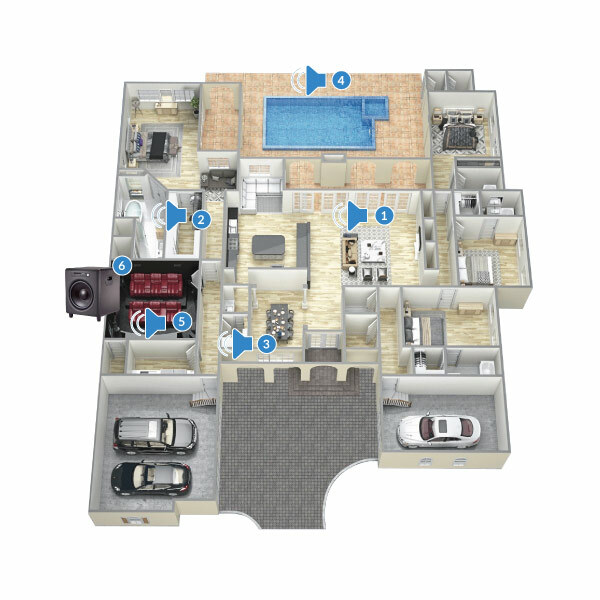 ECOSYSTEM is a remarkable energy saving feature that benefits the environment and dramatically reduces energy costs. When the amplifier isn’t in use, it automatically powers down, reducing both amplifier energy costs as well as the associated air conditioning costs that are required to cool the room and offset the heat of the amp. Once signal is present at any of the inputs, the CI-1255e springs back to life in as little as 10 milliseconds. Best of all, it turns on and off with no clicking noise, so you’ll never hear the difference, you’ll only notice it on your energy bill. The CI-1255e provides peace of mind with Fault-Safe™ automatic fault protection circuitry. Each individual channel is fully protected against overheating, overloading, low impedance, over voltage and under voltage. Should any of these faults occur, Fault-Safe shuts down any affected channels. The protection circuitry automatically restores each amplifier channel as soon as conditions return to a safe operating range. 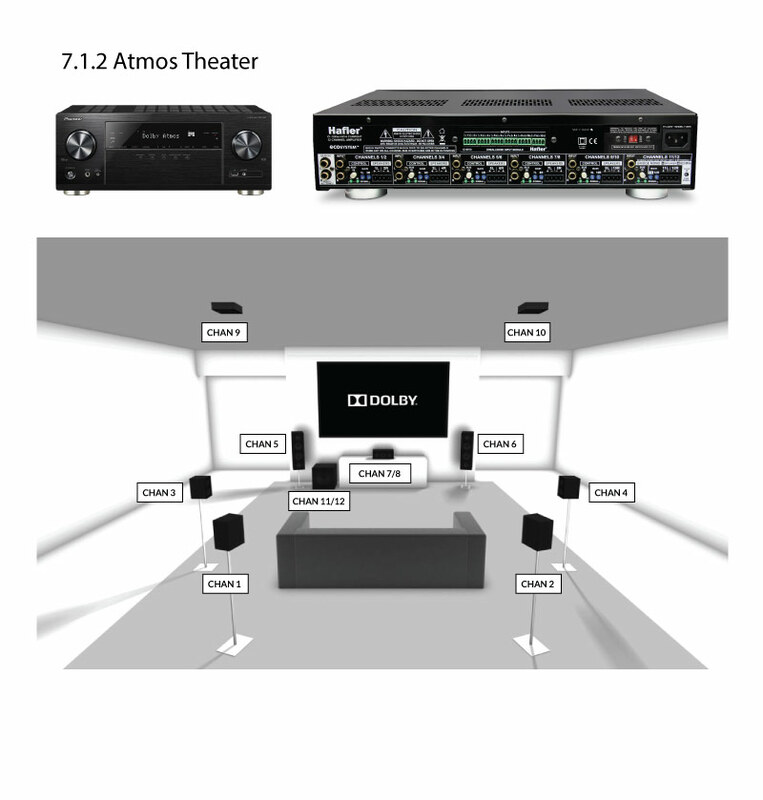 Easily feed a single source to multiple sets of speakers using the Global Bus inputs, while also using channels 9-12 to power a home theatre system and subwoofer. 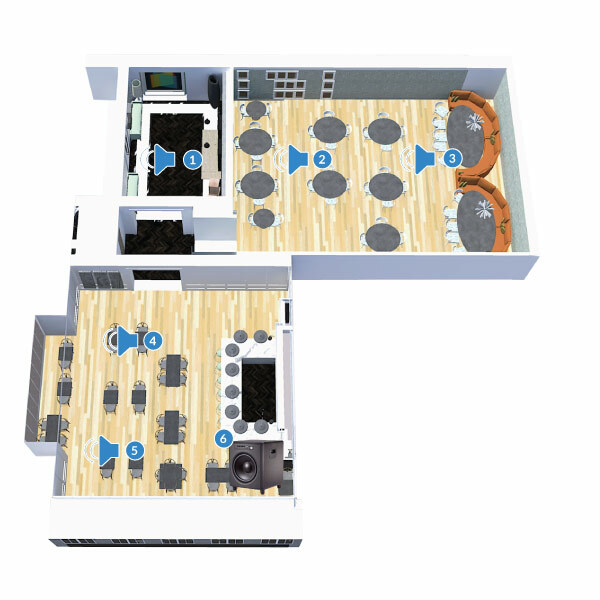 Individual channel inputs allow you to send different program material to separate rooms within a venue, feeding classical music to the dining room of a restaurant and rock music to the bar/lounge area. 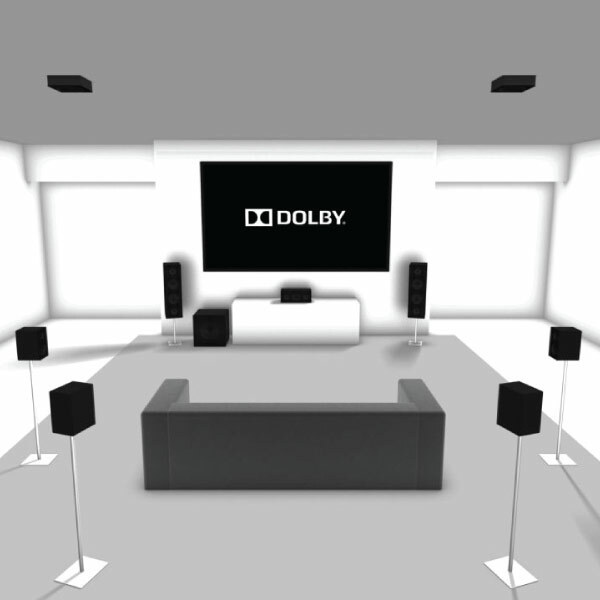 The CI-1255e is ideal for home theatres using the Dolby Atmos standard in 5.1 and 7.1 surround sound systems. In 1991, Kevin Knoll, P. E. a life-long stereo enthusiast and designer began hosting customer/dealer/distributor focus sessions on the subject of multichannel amplifiers and controllers. During these events, it became very apparent that there was as urgent need for no-frills, super dependable 8 and 12 channel multichannel amplifiers. Class-AB was an easy selection because of its superior sound quality over every other class but Class-A. Inefficient Class-A designs were never really considered due to their horrible impact on the environment as well as their crazy expensive manufacturing and operating costs. Individual LEDs on each channel to monitor signal presence and clip for each connected zone. Conveniently located to connect a cell phone, tablet, or Bluetooth® interface to the CI-1255e. High tensile power switch is rated at over 10,000 actuations for extra durability. 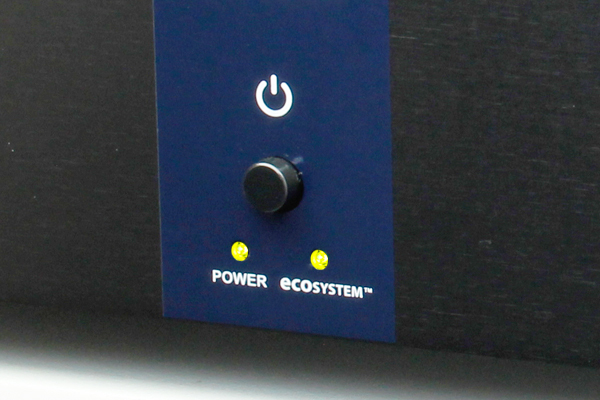 Illuminates to let you know the amplifier is on standby and in ECOSYSTEM power saving mode. Compact 17" x 3.5" x 11.5" (432 x 89 x 292mm) solid steel enclosure. 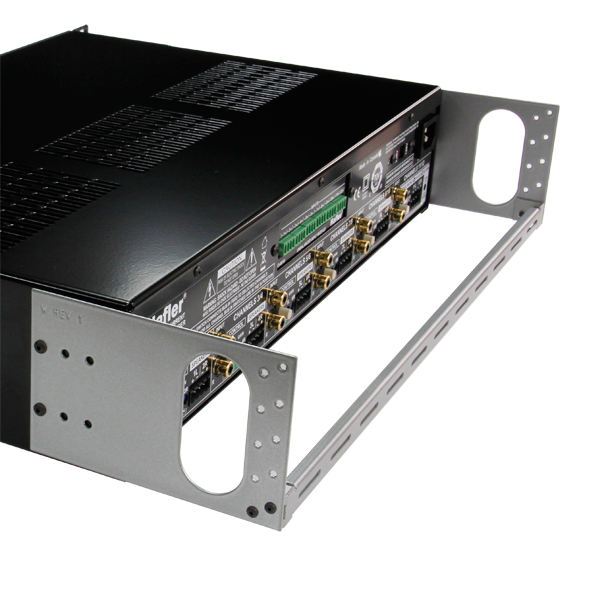 Optional rack mounting brackets to fit the amp into a standard 19” 2RU rack enclosure. Used to connect unbalanced source audio signal to the CI-1255e input channels. Input used when you want to feed multiple channels from the same source. 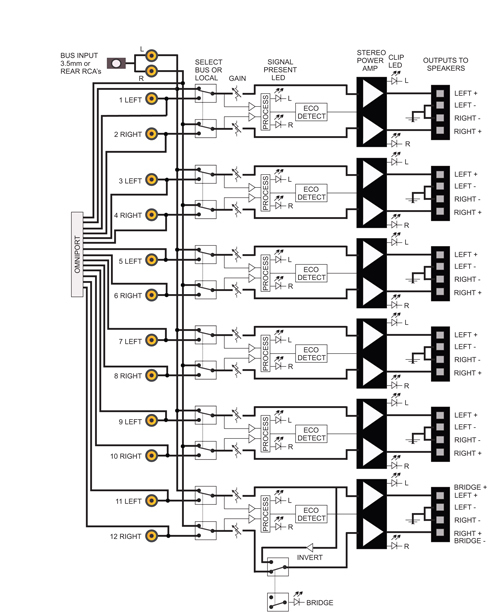 Routes input of each channel to the stereo input Bus. Individual level control for each channel, set using a small screwdriver. Detects signal presence – rear mounted to simplify setup when configuring and testing system. Euroblock (Phoenix® style) detachable screw-down connectors for quick, easy and reliable connectivity to the loudspeaker wires. Handles 18 to 10-gauge wire. Safety certified for use in the USA, Canada and Europe. 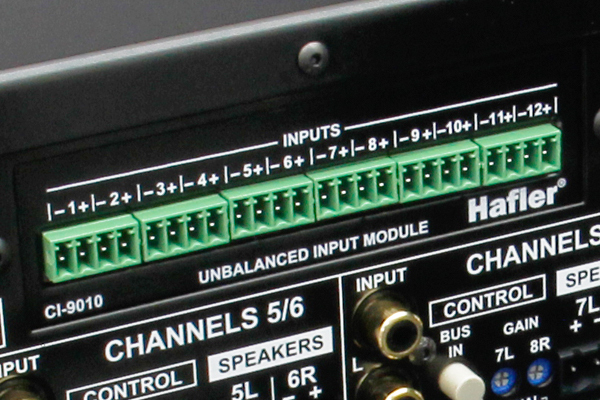 Module input slot, expands connectivity with optional Dante digital network card, unbalanced Euroblock input connectors, Jensen transformer isolation and more. Standard IEC 3-pole connector allows various cables to be used for international markets. Available on channels 11 and 12 for a 120 Watt mono output to feed a subwoofer. Push in to activate. 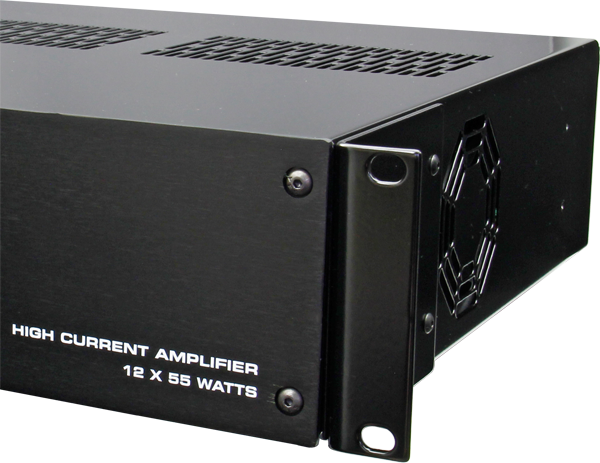 Twelve-channel amplifier rated at 55 watts RMS per channel – 100 Watt peak. Side-mounted fan delivers quiet cooling without the need for a dust filter. Low noise toroidal transformer with dual taps for 115 and 230-volt operation. Internally mounted and mated directly with the output transistors for optimal heat transfer. Automatic individual channel protection against low impedance, overheating, overloading, over-voltage, under-voltage and short circuits. How long does it take for the ECOSYSTEM to turn off? If the CI-1255e does not ‘see’ any signal for over one minute, the ECOSYSTEM circuit will power down the amp to save energy. Will I lose some music or communication during power up? No, this would be very unlikely as the ECOSYSTEM will re-activate the amp within 10 milliseconds which is less time than it takes to verbalize a consonant. Can I have all 12 channels play the same program material in mono? Yes. The easiest way to do this would be to use the CI-9020 stereo to mono converter. Can the CI-1255e be used in countries that operate at 240 volts? Yes. The CI-1255e is designed with sufficient headroom to handle 240 volts. Can I bridge other channels mono like channels 11 and 12? No, only the last two channels can be bridged. What happens if I use a loudspeaker with a lower impedance than rated? Do not do so. 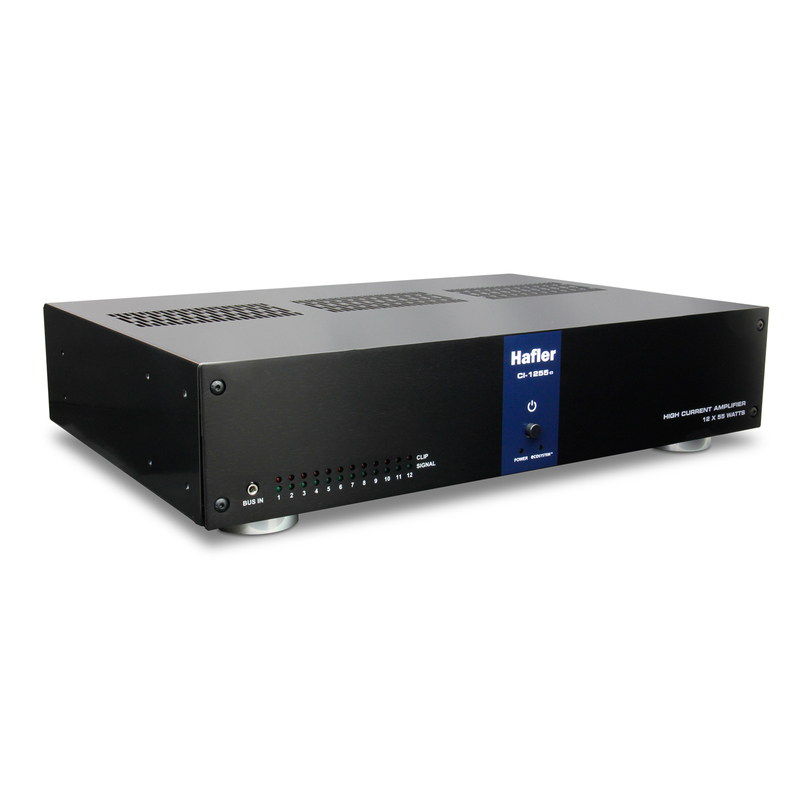 The Hafler CI-1255e is designed to work within certain limits and applying the proper load is critical to long term reliability. What happens if I use a loudspeaker that is rated higher than the recommended impedance? The efficiency of the system will be reduced and the system will not play as loud. Can I stack more than one amplifier on top of each other? Yes, but this must be done in such a way to ensure proper ventilation. If stacked on a shelf, ensure the large feet are employed and that the sides and back are free from obstructions. 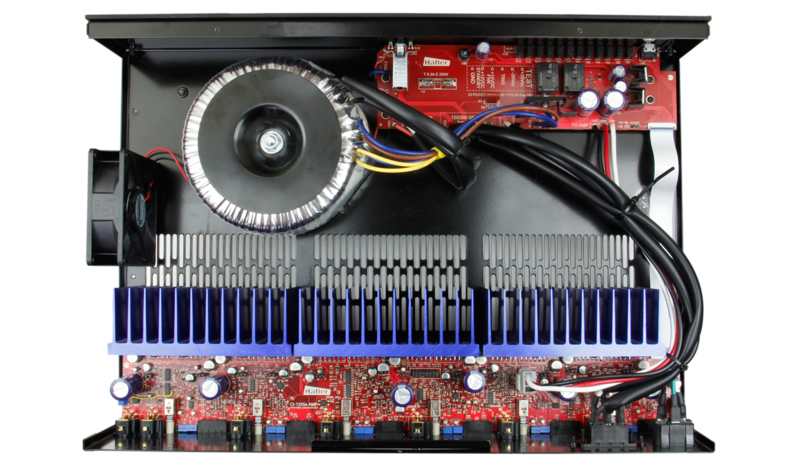 If you are rack mounting the CI-1255e using the optional 19” rack ears, leave a rack space in between each amp to ensure air flow is not restricted. Will that the fan will be noisy? The CI-1255e employs a very special ultra-quiet HushTone™ fan that produces less than 22dB of sound. This is quieter than most household appliances. When the amplifier is in the low power ECOSYSTEM mode, the fan is shut off. What happens if I notice a dead short - like a nail or screw through a speaker cable? Switch off the amp power switch immediately and remove the nail or screw. Using an ohm meter check to see if the wires are still not short circuited and they are working properly. Replace the wire if there are any problems. Do all channels need to be connected for safe use? No. You can use as many or as little channels as you like. Simply leave the amp channels that are not in use unterminated and make sure the bus switch is in the out position.